The late Alice Chappell supported the advancement of studio glass artists on an international scope. photo: chapman cole & gleason funeral homes. On July 7, 2013, after a two-year battle against cancer, Alice Chappell, owner of the former Chappell Gallery in Boston and Chelsea, died surrounded by family at her home in Woods Hole, Massachusetts. She operated a gallery in Boston from 1997 – 2004, and opened a New York City location in 2000, eventually focusing more on private selling. With her gallery exhibitions, appearances at art fairs, and carefully produced catalogs, Chappell worked to raise the profile of glass artists, especially from Asia and Australia. Before beginning her career in the business sector of art, Chappell first studied art history at Vassar College, obtaining her BA in 1964, and then at the University of Pennsylvania, where she earned her MA. Following her academic studies, she worked at the National Gallery of Art, and then at the Abright-Knox Art Gallery of Buffalo, NY. She moved on to become the director and sales manager at Ferdinand Roten Original Print Gallery of Baltimore, MD, and then worked at Poster Originals, Ltd., playing a large role in opening their SoHo gallery. Chappell then earned a MBA at Columbia Business School. Chappell notably developed a special display case for glass and crystal pieces called Baselight ® while working at Fine Lines International. She had a pioneering role in establishing Japanese crystal within American markets in the 1980s, opening up Hoya Crystal’s first American-soil gallery store in New York. 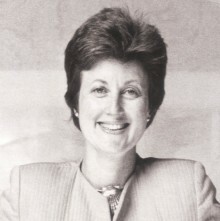 She was president of Hoya Crystal USA for ten years. In 1997, Chappell opened the first Boston gallery dedicated to contemporary studio glass, her very own Chappell Gallery, which remained open until 2004. In 2000, she opened Chappell Gallery New York, which displayed works of many rising American contemporary glass artists, as well as the works of artists from Japan, Australia, Canada, Denmark, and the Czech Republic. The gallery also published fourteen catalogues that documented the various artists they represented. A memorial service for Alice was held on Thursday, July 18, 2013 at 11 AM at the Church of the Messiah at 22 Church St. in Woods Hole, MA. Her ashes will be buried at the Forest Lawn Cemetery in Buffalo, NY at 11:00 AM on Saturday, July 20, 2013. Contributions in Alice’s name can be made to the Dr. Joyce Liu Ovarian Cancer Research Fund or to the Marine Biological Laboratory Associates Endowed Student Scholarship in lieu of flowers.